Did you know one of the top shiny hair tips involves linseed extract? It’s the very same ingredient used in furniture polish to make wood surfaces sparkle. Yes, linseed extract also works on hair. Hair and beauty insiders have known about the shine enhancing benefits of linseed extract for years. – Darker hair hues, like those favored by Millionaire Matchmaker Patti Stanger, reflect light better. 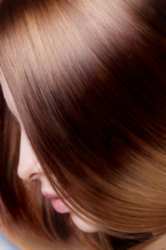 – When properly styled and maintained, darker hair colors have the potential to have a dazzling shine. – Straighter strands do a better job of transferring light than naturally textured tresses. – Curls, waves, kinks and coils will not reflect shine as easily as long straighter strands. 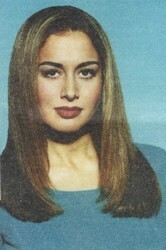 – Longer hairstyles can often achieve a brighter shine than shorter hairstyle. – Minimize use of hot tools which can dehydrate tresses and remove moisture which helps trigger shine. 1. 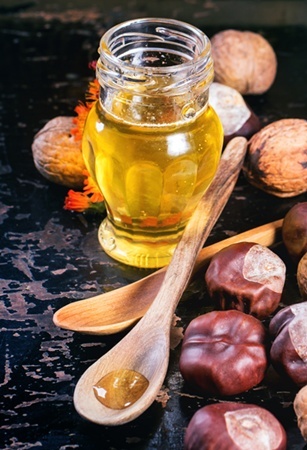 Hair products infused with olive oil help to hydrate and strengthen hair cuticles. Stronger strands means less split ends and more shine. 2. Shiny hair starts with eating nutritionally rich food, keeping our bodies properly hydrated with water and consuming healthy oils. 3. Only wet wash detangled hair in lukewarm water. Hot water can strip natural oils leaving hair dry, parched and void of shine. Wet wash only when necessary. 4. Select a hydrating shine enhancing wet wash formula for your hair type and texture. Experiment with diluted shampoo recipes, water only washing and conditioner only washes. 5. Apply rinse out conditioner in the shower. Allow to remain on hair up to five minutes. While hair is covered with conditioner, separate hair into 1-2″ sections. Detangle with a wide tooth comb or fingers from ends to roots. 6. After hair is completely detangled, rinse well and finish with a cool/cold water blast. Note: Although controversial, it’s my opinion that finishing a wet wash with a cool/cold blast will help close cuticles and encourage natural shine. 7. While still in the shower, do a gentle accordion style squeeze working around the head from side to side. 8. Towel blot, don’t rub hair. 9. Apply a shine-enhancing leave-in styling cocktail including, but not limited to, leave-in conditioner, defrisant or shine enhancing styling products. Only use as much as you need. Less is more. Too much product will dull hair and minimize shine. 10. If you must blow dry, towel blot and air dry first and finish with a blow dryer when hair is at least 50% dry. Use the coolest, slowest setting which helps encourage shine and shimmer. Note: Before blow-drying, spritz hair roots with a volumizing shine spray for extra thickness. 11. Once dry, apply 1 drop of shine serum into the palms of your hands. Massage well. Finger pick the serum through strands. Less is more, if you need more shimmer, you can always add more serum, but you can’t remove too much serum. For fine hair, put shine serum on the ends, but avoid adding to the roots. It will weight down your hairstyle. Just coat the ends of your hair. Opt for a mist with a gloss element for naturally textured hair in order to achieve shine without using heavy creams, pomades or serums. 12. Lightly coat the ends of your hair with a glossing cream. The smoother your hair, the better it will reflect light. Consider using a gloss on the go touch-up product in the form of shine inducing cloths. Experiment with DIY at-home shine enhancing treatments. In some cases using natural ingredients can work as well if not better than store bought items. Although some websites may tell you to deep condition more than once a week, be careful not to over-condition, unless advised to do so my your hair expert. Too much deep conditioning can actually coat hair and leave it over treated. 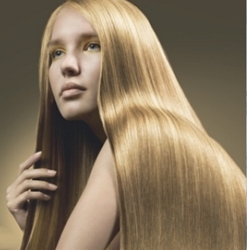 Coarser hair usually responds well to deep oil treatments which will help to repair styling damage. Tawney Cyprus – Unforgettable – CBS/TV – All Rights Reserved – Naturally textured hair doesn’t transfer shine infusing light as easily as straight hair. Not only will it help to kick hair into high-shine gear it will enhance the true glossiness in your hair providing a glam finish. Look for an olive oil-based product such as a glossing shampoo and conditioner. There are several options available. Do your research and homework. Remember that shiny hair starts with the scalp. Indulge in weekly scalp massages being careful not to scratch the scalp with nails or other other sharp items. When brushing hair, be sure to use 100% boar bristle brushes which will help distribute natural oils throughout the strands. While many of the shiny hair tips listed will work for the majority of people who try them, not all tips will work for all types and textures of hair. Experiment with shiny hair tips you believe will work best for you, your hair and your lifestyle. Be willing to try new treatments. This entry was posted on Monday, December 15th, 2014 at 6:10 pm	and is filed under Hair. You can follow any responses to this entry through the RSS 2.0 feed. Both comments and pings are currently closed.